Warriors and Cavaliers begin play tonight, and with all the deserved attention the Oakland/Golden State Warriors have been getting there have been a number of articles about the star players, including Klay Thompson. 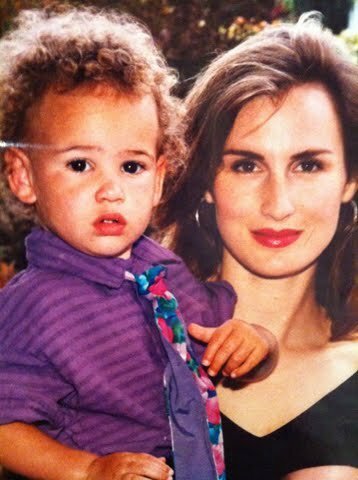 I recently saw an article with a picture of Klay as a toddler with his mom, Julie. Does anyone else think Julie from the early 90's looks familiar? I saw only a couple of UP volleyball games in the mid-80's, but I believe she was a Vancouver area high school volleyball star who played volleyball at UP for a couple of years in the mid-80's. Hmm, wasn't Klay's dad Mychal a Blazer around that time? Also, Klay is quoted as saying, "We got our height thanks to (Dad), but our athleticism came from Mom…." Anyone else remember her from that time, or am I just hallucinating, again? 1. James is an amazing athlete....his 44 points are a testament to that....but his shot near the regulation buzzer missed and it went to OT. 2. Curry is not only a good shooter, he's crafty and smart. Unable to drive to the basket, his quick open shots and ability to draw fouls in the OT were the difference. 3. The game was played in Oakland....but you'd never know it listening to the media folks who just can's seem to say anything except San Francisco or San Francisco Bay Area. 4. If Irving can't come back for the Cavs, it could be a short series. DoubleDipper wrote: Warriors and Cavaliers begin play tonight, and with all the deserved attention the Oakland/Golden State Warriors have been getting there have been a number of articles about the star players, including Klay Thompson. heavy.com wrote: Back when she was Julie Leslie, she attended Ridgefield High School in Washington, where she was a track and volleyball star. She then went to the University of Portland before transferring to the University of San Francisco and dominating as a star setter. After setting multiple records at the University of Minnesota, Mychal Thompson was drafted by the Portland Trail Blazers with the No. 1 pick in 1978. He and Julie met at a gym at the University of Portland, and they married in 1987. Actually, now that I know more of the story, I didn't actually see her play, it was from an article in Vancouver's Columbian that I recognized her picture. So she and Mychal "met at a gym at the University of Portland." Hmm, as I recall, the Chiles Center opened in the fall of '84 and Julie graduated from Ridgefield in 1982 and stayed two years at UP.....do you suppose they met in Howard Hall? Now that's retro! DoubleDipper wrote: If Irving can't come back for the Cavs, it could be a short series. PG Kyrie Irving is apparently done for the series with a broken kneecap. So once again SMC grad Matthew Dellavedova will have to step into the breach. If there’s a glimmer of hope in what is a bad Cavaliers situation, it’s Dellavedova’s recent track record when forced to take on more minutes. He's already had to play four 30-plus minutes games in the postseason, and the Cavs have won all four by an average of 12.8 points. Dellavedova has averaged 14.0 points in those games, shooting 40.7 percent from beyond the 3-point line. Dellavedova being credited with 'lock-down' defense on Steph Curry, and the Cavs hang on for an overtime win to tie the series. Cavs up 2 games to 1. DoubleDipper wrote: One word: Dellavedova! Falling down, scoop LH, transfer to RH, bank shot. That's H-O-R.
OregonLive wrote: Reveno said he figured, even after Dellavedova was not drafted in 2013, that he could have a place in the NBA. "He's the kind of kid that I would never bet against. If he got in the right spot, the right situation, you never know because of his high skill level and his toughness," Reveno said. After being hospitalized with dehydration after exhausting himself during Game 3 of the NBA Finals, the hustling guard was upright - a good sign for the Cavaliers. Dellavedova was released from the Cleveland Clinic on Wednesday and said he's ready to play Thursday night against the Golden State Warriors, who have spent the past three games being bothered by the pesky Australian. Well, the best TEAM won! IMO LeBron James is the best athlete and basketball player playing now, but the Warriors "Strength in Numbers" is not just a marketing slogan, but a team philosophy. They've done it all season, when the team bogs down a little, as also happened in NBA Playoffs, Steve Kerr goes to the bench and finds the right guy and right formula to get the win. They're fun to watch! Congratulations to the folks in Oakland. It's been a while since sports teams there have brought them a national championship (the Oakland A's won the "Earthquake Series" over the Giants in 1989 and the Oakland Raiders beat the Eagles in the Super Bowl in 1981). DoubleDipper wrote: Well, the best TEAM won! Still think James is the best, but the TEAM that Kevin Durant is a part of is definitely the best. Good to see the Larry O'Brien Trophy back in Oakland!